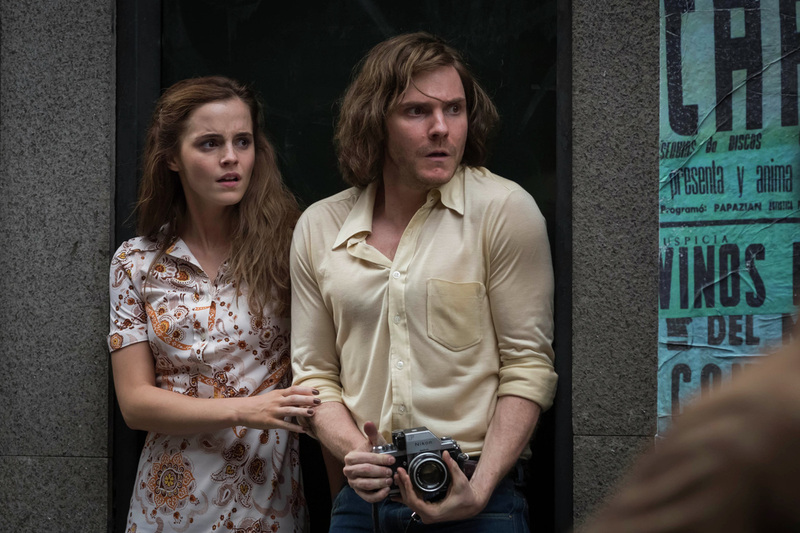 ​A movie review of COLONIA. General Augusto Pinochet led a military coup in 1973 in Chile, becoming dictator until 1990. Multiple atrocities were committed. National wounds still understandably raw, filmmakers Pablo Larraín and Patricio Guzmán have been probing the events and repercussions, through narrative fiction and documentary respectively, with skill. Instead of cataloguing abuses, they have approached the subject askew. The aftermath of tyranny can be hard to swallow for multiple reasons; shifting the context therefore might, in the hands of the deft, refract (not dilute) the trauma for potentially profound commentary. Director Florian Gallenberger takes a leaf from their playbook, and does not concentrate on Pinochet. An unobvious story is focused on, to illustrate the whole. As a filmmaker, Gallenberger has stepped up his game from previous effort CITY OF WAR – THE STORY OF JOHN RABE. His latest does share an unfortunate commonality: Movies in the shadow of superior works. THE STORY OF JOHN RABE, on the Nanjing massacre, pales by comparison to Chuan Lu’s CITY OF LIFE AND DEATH. And while the specific subject is different, POST MORTEM is concerned with the initial change of power in Chile. However, Gallenberger does have his heart in the right place. A cinematic magnifying glass levelled over savage inhumanity is usually welcome. Inspired by true invents. 1973. Breezy pop song, ‘Ain’t No Sunshine’ by Bill Withers, lulls any unsuspecting audience members into a false sense of security. As does Emma Watson as an air stewardess; fetishizing the lead is not on the agenda. Landing in Santiago, Lena (Watson) uses her R & R to spend some quality time with German boyfriend, Daniel (Daniel Brühl). Cute montage gives way to the brutal takeover. Daniel is a photographer supporting democratically elected President Allende. As the incumbent is removed, it becomes dangerous for Daniel, as fellow sympathisers are rounded up. Bravery (or recklessness) has him capture the round-ups, only to get arrested and taken to the National Stadium. Scores of prisoners line up, as a man sinisterly wearing a sack on his head, concealing his identity, a collaborator, identifies to the military the newly labelled dissidents. Taken to the titular Colonia Dignidad, “the colony of dignity”, an enclave-sized prison masquerading as a religious retreat, Daniel is tortured; maltreated so badly that the doctor suspects brain damage. Faking his injuries, Daniel is permitted a loose rein to reconnoitre the large compound. Colonia Dignidad is run by a sadist, Paul Schäfer (Michael Nyqvist). In a refreshing gender reversal, it is Lena who courageously joins the cult in attempt to rescue her love. Cathartic THE GREAT ESCAPE this is not. COLONIA uses the microcosm of merciless exploitation to illustrate the nature of authoritarianism.